Released in 1994, Shaq Fu has the distinction of being one of the few games ever made—quite possibly the only one—to have a website dedicated to nothing less than its utter eradication from the collective memory of human civilization. In truth, it's probably not that uniquely awful, but it certainly wasn't very good when it was new, and as sometimes happens, that legendary rep has eclipsed the more mundane reality. Regardless, it's not the sort of game you'd expect to merit a sequel, but developer Big Deez somehow managed to crowdfund more than $450,000 to help fund one, and now, two years later, there's actually a trailer. There are so many questions. Why would anyone want to do this? Why would anyone want to help them do this? Why would anyone go ahead and do this instead of taking the money and running? And why is baby Shaq stuffed, Moses-like, inside a floating purse? These are questions I cannot answer, but I do have to give credit to the people behind Shaq Fu: A Legend Reborn for having a sense of humor about it all. Whether it can follow through on that initial, admittedly very thin, promise with anything amounting to decent gameplay is a question we'll have to wait awhile to answer, as the game isn't slated to come out until sometime next year. 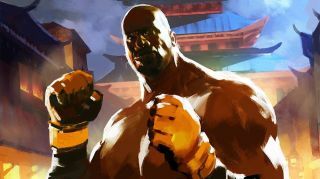 For now, you can keep up with all the latest Shaq Fu-ness at the Shaq Fu Facebook page.